This entry was posted in Easter, Luke, Luke 24, S. Kent Brown on April 19, 2019 by Administrator. Published in Celebrating Easter, eds. Thomas A. Wayment and Keith J. Wilson, 157–76. Provo, Utah: BYU, Religious Studies Center, 2007. It is a joy to ponder and appreciate the eternal importance of Easter. On the day before Easter, the body of the Lord lay in the tomb while his spirit inaugurated his redemptive work among the throngs in the spirit world. What a thrilling day it must have been for them to receive that visit from him. I imagine that the timing caught them by surprise, as it did among the Nephites. How much joy and excitement there must have been on this day before Easter on the other side of the veil. This entry was posted in Easter, John, John 18, John W. Welch, Luke, Mark, Matthew on April 13, 2017 by Administrator. I am convinced that if it were not for commercial and cultural factors, Easter would be more important to us than Christmas. As President Hinckley noted in the quote above, Christmas is only significant because of the miracle of Jesus’ atoning sacrifice and his glorious resurrection. 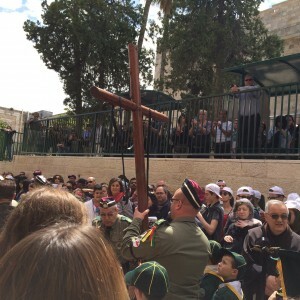 With Palm Sunday and the week before Easter, much of the Christian world enters into a period of reflection and celebration known as “Holy Week.” Each of the events chronicled in this last week casts light on Jesus’ true nature as the Son of God, and reviewing them deepens the faith of believers in his matchless love. While the LDS community does not formally observe Holy Week, the period from Palm Sunday to Easter morning present a wonderful opportunity for believers to use the scriptures to reflect upon the last days of our Lord’s earthly ministry. Striving to observe Holy Week and celebrate Easter more fully over the past years has convinced me that the best ways to do this are first through personal study, and second, through developing rich family traditions. My 2011 volume God So Loved the World: The Final Days of the Savior’s Life and a subsequent online blog, LDS Seasonal Materials, represent my previous attempts to make Holy Week more accessible for Latter-day Saints. This current effort, a collation of the New Testament texts of Jesus’ final week, aims to supplement my earlier materials by bringing the scriptural accounts to individuals and families in what I hope is a useful format. In one sense, it is a collection of scriptures in the early Christian tradition of a lectionary, a collection of readings for given days or occasions. In another, it is a soft academic effort to help readers better understand the source materials—particularly how the four gospels relate to each other while simultaneously painting unique portraits of Jesus and his final week. It is more of a collation than a harmony, and it is arranged as a reader’s edition, formatted in paragraphs rather than verses, labeling sections, and using modern conventions such as quotation marks to better indicate dialogue. Whether used in connection with my earlier publications or used alone for one’s scripture readings in the days leading up to Easter, I hope that you and your families may find this a useful resource in celebrating the greatest story ever told. This entry was posted in Easter, Eric D. Huntsman, John, Luke, Mark, Matthew on April 4, 2017 by Administrator. For Latter-day Saints, Luke chapter 21 presents readers with one of seven versions of Jesus’ sermon on the Mount of Olives. Naturally, we know the versions that are presented in Mark 13 and Matthew 24–25. But there are more. We first notice that the Joseph Smith Translation completely freshens the reports of the sermon preserved by Mark and Matthew with a large number of changes that render their records largely the same; fewer adjustments appear in Luke 21. In each of the JST versions of Matthew, Mark, and Luke, the alterations bear on the meaning and thrust of Jesus’ words. Thus far, we see six versions—those in the three synoptic Gospels and those in the JST version of those Gospels, one of which is partially reported in Joseph Smith—Matthew of the Pearl of Great Price. The seventh record of the sermon lies in Doctrine and Covenants 45:16–59. As a preface, the Lord tantalizingly declares that “I will speak . . . and prophesy, as unto men in days of old. And I will show it plainly as I showed it unto my disciples as I stood before them in the flesh” “upon this mount,” the Mount of Olives (D&C 45:15–16, 48). With these words, we learn the vivid detail that Jesus imparts in the sermon while standing before his disciples, as a distinguished teacher, not sitting with them as Matthew 24:3 and Mark 13:3 lead us to believe. In contrast to Mark 13 and Matthew 24–25, Luke chapter 21 provides two delectable dishes, not just one, ending with crowds still seeking Jesus’ company (see Luke 21:38). The first small dish consists in the refreshing story of a poor widow’s two mites, complete with tasteless displays of wealth that contrast with her tiny gift to the temple that glows with her adoring devotion (see Luke 21:1–4). Why is this story in this place? Possibly because of Mark’s placement of it just before the Savior’s sermon on the future (see Mark 12:41–44). On this view, the fact that Luke includes this story here may demonstrate a dependence on Mark’s order of events for Jesus’ last week. Perhaps significantly, Matthew omits the story, effectively dulling the notion that Mark serves as Luke’s main or only source for Jesus’ last days in Jerusalem, including the sermon on the Mount of Olives. Another possibility glimmers in front of us: Jesus’ mention of “widows’ houses” in the foregoing (Luke 20:47) may instead form a verbal bridge that brings the widow’s story here, pointing to a catchword association, a feature that may also infuse Mark 12:40–42. But why recount this story about the widow before rehearsing the sermon about the fate of Jerusalem and its citizens? Because, after a first glance, her story brings together a raw, untouched comparison between her situation and the gleaming opulence of both the temple and its contributors, the latter offering a practiced yet worn piety that will not save the temple from destruction. In addition, we sense that, while the temple’s importance remains strong in the minds and hearts of even the poor, its officials and major contributors are out of touch with common persons, rudely flaunting their wealth in their presence. Such a perception may also give flavor to Jesus’ prior talk about those who “devour widows’ houses” (Luke 20:47). In the eschatological discourse on the Mount of Olives, the second and longest part of this chapter that rehearses Jesus’ grand and often frightful vision of the future (see Luke 21:5–36), the words of Jesus stir together a number of prophecies that appear elsewhere in Luke’s Gospel. The list is short: the exhortations to watch (see Luke 12:35–48; 21:34–36; especially JST 12:35–57); the warnings about deceptions (see Luke 17:20–24; 21:8–9); the desolation that stalks Jerusalem (see Luke 13:34–35; 21:20–24; JST 13:35–36); and the signs of the Second Coming (see Luke 17:26–37; 21:25–28; JST 17:26–40). The main question is whether the Savior indeed speaks such words away from Jerusalem, as Luke reports Jesus’ teachings. The answer is Yes, as both the JST version of Luke 12:41–45 and Jesus’ declarations about Jerusalem’s fate and the future kingdom make abundantly clear (see Luke 13:33–35; 17:20–37). Hence, we should see Jesus’ discourse on the Mount of Olives as one wherein he brings together sayings uttered on other occasions, along with fresh prophecies, and shapes them into a whole piece that addresses the issues of the future of Jerusalem, of the disciples, and of the end-time. In light of the Savior’s introduction to the sermon preserved in modern scripture, “As ye have asked of me concerning the signs of my coming” (D&C 45:16), no compelling reason exists to suppose that it is Luke who selects some of these sayings from their original setting in this sermon and inserts them into other, earlier contexts, or vice versa. Even so, we find what may be hints that Luke pens his version of the sermon after the Jewish War (AD 66–70), for he tops it with the vivid notation, “ye shall see Jerusalem compassed with armies” (Luke 21:20; also 19:43). The other accounts omit this detail. Instead, they feature the “abomination of desolation” (Matt. 24:15; Mark 13:14), an expression from the book of Daniel which the Joseph Smith Translation interprets as “the destruction of Jerusalem” (JST Matt. 24:12; JST Mark 13:14; see Dan. 9:27; 11:31; 12:11). This said, reasons exist to question the scholarly insistence that Luke writes in hindsight, after the end of the war. This view of the discourse does not enjoy widespread support. Many see the sermon as a collection of disparate sayings that Mark, the first Gospel writer, artfully stitches together into an absorbing sermon that simply reflects the major concerns in the primitive church’s preaching, that is, warnings against false Christs and prophets, the sufferings of believers, the judgment upon Jerusalem, and the requirement of disciples to watch for Jesus’ return. In this view, much of the sermon illumines Jesus’ teachings, but Mark alone, or his source, is responsible for its ordering and flavoring, or even its composition. For Latter-day Saints, both the inspired changes introduced into the Joseph Smith Translation of the synoptic Gospels and the first-hand account of the sermon that the Savior rehearses in Doctrine and Covenants 45:16–59 stand firmly against such a view. Instead of Mark presenting a table of teachings based on the church’s preaching interests, it seems more likely that it is Jesus’ words in the sermon that set the agenda for those interests. In a completely different vein, this sermon will save the lives of uncounted disciples who, knowing of Jesus’ warnings about the fall of Jerusalem and its temple, will flee from the capital city which becomes the headquarters of the church in its early days. Rather than retreat into the city for safety, as thousands do when war breaks out with Rome late in AD 66 and again when Roman armies approach Jerusalem’s gates in AD 70, Christians flee northward, many of them settling in a gentile town, Pella, on the east bank of the Jordan River. There they wait out the war and survive intact. This text is extracted from S. Kent Brown, The Testimony of Luke, 929–932. Bultmann, History, 125; Francis W. Beare, The Earliest Records of Jesus (New York: Abingdon Press, 1962), 216; Fitzmyer, Luke, 2:1323–25; George R. Beasley-Murray, Jesus and the Last Days: The Interpretation of the Olivet Discourse (Peabody, Mass. : Hendrickson Publishers, 1993), 350–65. This entry was posted in Easter, Luke, Luke 21, S. Kent Brown on April 12, 2016 by Administrator. This post is excerpted from Dr. Huntsman’s blog, http://huntsmanseasonal.blogspot.com. This entry was posted in Easter, Eric D. Huntsman, John, Luke, Mark, Matthew 1 on March 27, 2016 by Administrator. This post is excerpted from God So Loved the World and from Dr. Huntsman’s blog. The experience of Mary Magdalene in finding the tomb empty is much expanded in the account of John. 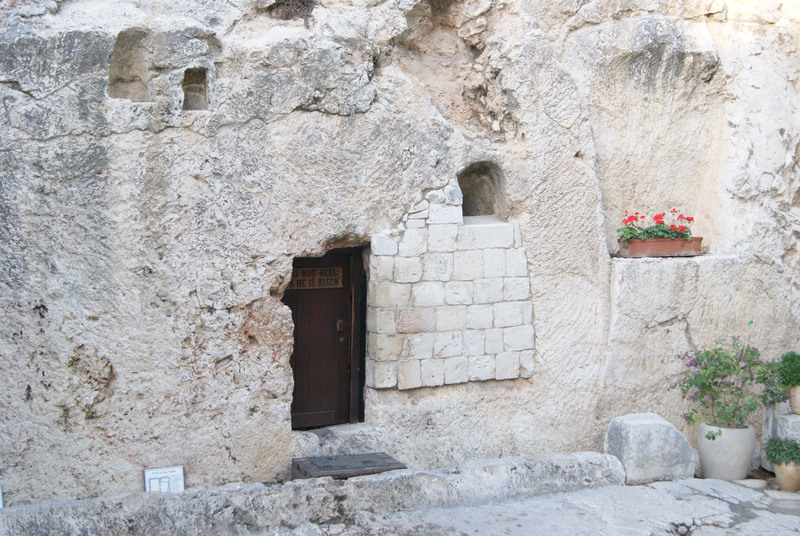 In the account of Jesus’ burial in John 19:41, the sepulchre is specifically described as being in a garden. It is in this garden that Mary’s touching experience with the Risen Lord is then described in John 20:1–18. In this account Mary came to the garden tomb alone, and, finding it empty, she ran to tell the disciples that Jesus’ body was missing. Upon hearing this news, Peter and another disciple, usually assumed to be John, ran to the garden, stooped to enter the tomb, and found in it only the linen cloths with which Jesus’ body had been wrapped. (John 20:3–10). Yet Peter and John too serve as examples for believers, even when our witness is less secure than that of Mary. When she had told them that the tomb was empty, they did not walk, they ran to the garden to see whether her report was true. And though they did not see the Risen Lord at that time, seeing the tomb empty and the burial clothes lying there, they nonetheless believed. Do we too run to find out whether the testimony of the resurrection that we hear and read from others is true? And are we able to accept on faith its reality even when we have not yet seen the resurrected Christ? This entry was posted in Easter, Eric D. Huntsman on March 26, 2016 by Administrator. In antiquity crucifixion was a choice of punishment since the time of the Persians, but it was undoubtedly the Romans who perfected it as a form of torture. The Jewish historian Josephus described crucifixion as “a most pitiable death” (Jewish War 7.203). We have numerous ancient accounts that mention crucifixion, but few of them describe the process in any detail. Nevertheless, these accounts generally corroborate the descriptions recorded in the four New Testament Gospels. In antiquity crucifixion was performed in a number of different ways. Some victims were impaled; others were tied to a cross or a tree—sometimes they were nailed. 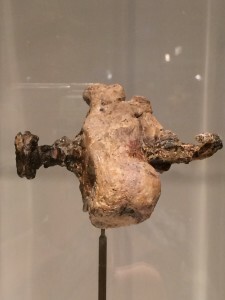 An ancient heel bone with a nail piercing it. From the Israel Museum. Archaeologically, only one set of remains has been found of a person who was crucified in Palestine prior to 70 AD. We know that the person was crucified because the nail was still in the right calcaneum (or heel bone). [See the picture taken at the Israel Museum]. Sometimes the victims were crucified while alive, but sometimes it was after they were dead. Sometimes the legs were broken in conjunction with the crucifixion. By Roman times, crucifixion was preceded by flogging and the victims were sometimes required to carry the beam of the cross. Usually the bodies were left to be devoured by birds and wild animals, but in Roman times, it was possible for the family to petition to take the body and bury it once death had been verified. This entry was posted in Easter, Gaye Strathearn on March 25, 2016 by Administrator. Why should the cross be meaningful to Latter-day Saints? As I have thought about Christ’s crucifixion and the central place that Good Friday has historically and theologically held in Christianity, I would like to suggest four reasons why I believe that the cross should hold an important place in Latter-day Saint private and public discourse. The most important reason that we should consider the cross is that both doctrinally and functionally, it is part of Christ’s atonement. I think that it is fair to say that traditionally Latter-day Saints have emphasized the atonement as taking part in Gethsemane. Yet the scriptures, both the Bible and Restoration scripture, repeatedly teach that the events on the cross also have an important part to play in our redemption. Paul taught the Romans that “we were reconciled to God by the death of his Son. . . . by whom we have now received the atonement” (Romans 5:10–11). The Book of Mormon frequently teaches that redemption is made possible through the “sufferings and death of Christ” (Mosiah 18:2; Alma 21:9; 22:14; 3 Nephi 6:20). The Doctrine and Covenants teaches that Christ “was crucified for the sins of the world” (D&C 53:2; 54:1), and that “redemption had been wrought through the sacrifice of the Son of God upon the cross” (D&C 138:35). The scriptural metaphor that we can be “lifted up” because Christ was lifted up on the cross is a symbol of God’s great love for his children. All four Gospels agree that on the last night of his mortal life, Jesus shared a special meal with his closest disciples in an upper room in Jerusalem. 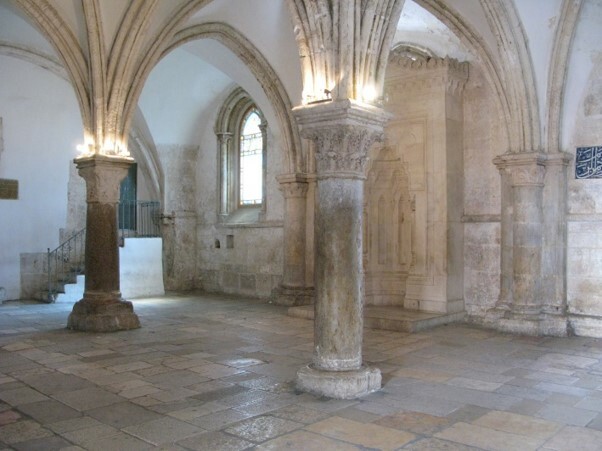 Described as a large, well-furnished room, it was probably in one of the larger houses in the upper city, a wealthy area now known as Mount Zion. This entry was posted in Easter, Eric D. Huntsman, John on March 24, 2016 by Administrator. One of the beautiful contributions of John to our understanding of the events and teachings of Jesus’ last night are passages that include Jesus’ last discourses and his beautiful Intercessory Prayer (John 13:31–17:26). 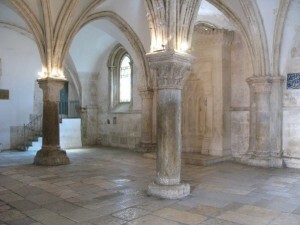 Delivered in the Upper Room where the Last Supper was held and then along the way to the Mount of Olives, chapters 14 and 16 focus on the imminent departure of the Savior. However, they also frame—and hence emphasize—chapter 15 with its beautiful image of the disciples abiding in Jesus as branches in a vine. I Am the True Vine, said Jesus. In other words, while he may be going away physically, he will nonetheless be present among believers in a real way. 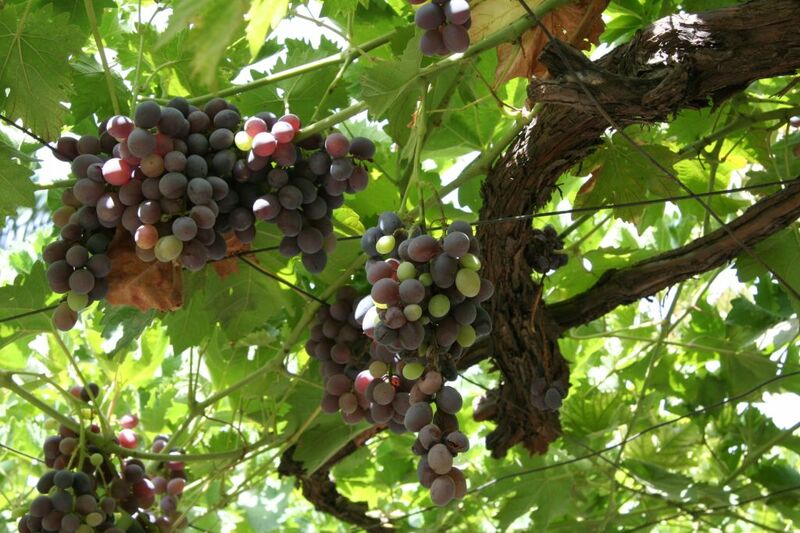 Just as branches derive their life and strength from the main vine, so we draw our spiritual life from Christ, without whom we would die spiritually. Abiding in him we live and receive strength—or grace—to bring forth “much fruit” and enjoy his love (John 15:1–10). This entry was posted in Easter, Eric D. Huntsman, John, John 13, John 14, John 15, John 16, John 17, Sermons of Jesus on March 24, 2016 by Administrator.